The idea of building a Parish Church in the Eastern Suburbs of Sydney started early in 1956. With the concerted efforts of some 100 families, the construction of the present sacred edifice was completed in early 1962. Since that year, Church services have been held without interruption by the Parish Priest, Fr. Miltiades Chryssavgis. Beginning with the first Liturgy of 8th April, 1962, the Church was consecrated by Archbishop Ezekiel and dedicated as a War Memorial by the Governor of New South Wales, Sir Eric Woodward, on 25th November, 1962. Greek Orthodoxy made its entry in Australia, towards the end of last century, and is here to stay, not only for those from traditional Orthodox countries, but for all Australians. It offers ‘fullness of life’ promised by Our Lord (John 10:10). The Greek Orthodox Church of St. George, Rose Bay, is one of over one hundred parishes in Australia belonging to the Greek Orthodox Archdiocese in Australia, bearing witness to Christ’s truth in contemporary Australian society. 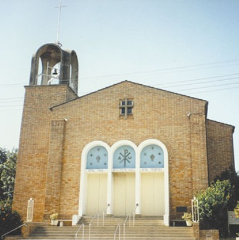 From its inception, the Greek Orthodox Parish of St. George has considered itself to belong to the very essence of Australian culture, by responding to many of its requirements, especially the use of English in prayer and worship, the introduction of Orthodox literature in the English language and an awareness of the broader mission of Orthodoxy in Australian Society.